Adjusting tower guys is a methodical process. You start at the bottom and work your way to top, guy set by guy set, making the tower vertical and setting the tension. This is done during construction and again once or twice in the following days or weeks after the guys, grips (or clips) and other linkages deform under tension until they reach their final shape. When done properly there is really nothing more to do except for regular maintenance. Once or twice a year guy tension should be measured and all parts of the guys should be inspected, remotely by binoculars if necessary. Trouble signs include tension differences, fraying, rust, fretting, deformation, and stress fractures. In this article I'll talk about some of these in the context of maintenance I did this spring. It isn't a lot of work but it must be done to ensure a safe installation. Maintenance is certainly easier than constructing the steel guys and attaching them to the tower! What is needed now is finesse rather than brute strength. The tension in each set of (3) guys will be equal unless something is amiss. Problems are typically one of asymmetry of anchor placement, gauge error or tower misalignment. The first of those should be addressed when the tower is sited, before construction begins. The levelness of the site is easy to overlook but it can result in anchors at different heights and therefore unequal angles between the guys and tower at every guy station. Measurement error is common with the gauges many hams use. For example, the Loos PT-3 gauge I use (as do many hams) is calibrated for 1 x 19 stainless steel marine cable. For 1 x 7 EHS guy cable the measurement is low by perhaps 10% due to the greater stiffness of EHS. This is easy to deal with by applying a correction factor. What is more difficult is that the larger strands of EHS affect the lay of cable in the gauge guides so that the measurement varies with where the gauge is placed. In my experience with the 5/16" EHS the variation can be 100 lb. 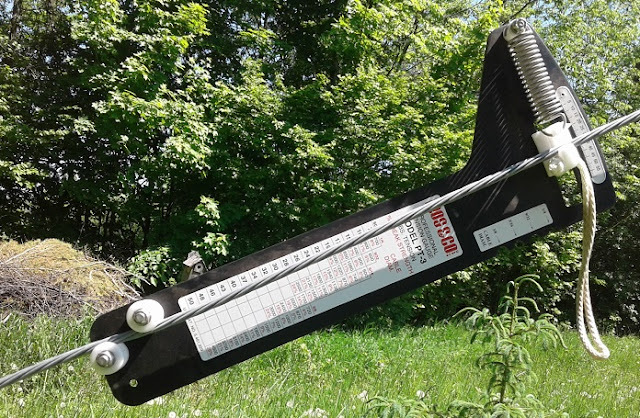 For best accuracy with this gauge I take multiple measurements and shift the position of the gauge a small amount for each measurement. Then I record either the average or the majority measurement. I strongly recommend recording the measurements. Not only will you instantly spot problems that you might miss if you solely rely on your memory you will easily notice changes over time. I put the measurements in a spreadsheet. I do not replace the old data when new measurements are made. Looking at the trends over time can be valuable to keeping your tower in good condition. Notice that I record the raw figures from the gauge, not the conversion to real units. This keeps the data evergreen should you discover at some point that the gauge is off by, say, 15% rather than 10%. This way you never have to guess which correction value you used in the past, and measurements are more easily compared. Weather impacts measurements. In extreme climates tension can increase 10% or more in January from July due to temperature induced contraction. Record the date or temperature to avoid surprises. Although light wind is no impediment to tension measurement you should not do so in high winds. The wind load of the tower and antennas will raise the tension in the windward guy(s) and lower it in the others. The tension will also change second by second. Out of interest I tried this in a wind storm (80 to 90 kph plus gusts) and found the tension rose 100 to 200 lb in the windward guys and dropped up to 300 lb in the two leeward guys. Add notes for anomalous observations you can refer back to later. Examples include suspected distortions from perfect vertical alignment by height and tower face and rust spots that need attention. Turnbuckles, thimbles, EHS guy cable and other hardware rusts. Galvanizing can delay rust for many years but will not do so forever. Surplus parts will rust sooner due to their previous exposure to the elements. Rust on the surface of large diameter steel is not immediately urgent since it is so thick and, if specified for this application, often has more strength than needed. No matter the degree of urgency it is strongly advised that rust be repaired so that a negligible problem does not grow into a serious one. If you're going to paint over the rust it is necessary to first remove the loose material. Some coatings are designed for rusty steel while others are not. In the latter case all the rust must be removed. A steel brush or sandpaper may suffice while in difficult cases a rotary steel brush mounted on a drill speeds the work. With power equipment be sure not to be so enthusiastic that you weaken the base metal or remove more galvanizing than absolutely necessary. Galvanized steel often requires a special primer before the finish coats. That is how I refinished the LR20 tower sections before raising the tower. For the turnbuckles and attached hardware I followed the advice of a tower pro to thoroughly clean them once they're installed and adjusted and liberally spray them with cold galvanizing paint. Two coats recommended, then again in future should any rust appear. All parts are hot dip galvanized but the turnbuckles and some of the other hardware are used and needed some refinishing to protect against rust. In Canada as in many countries the quality of consumer grade oil based (alkyd) paints is often not what it once was due to environmental regulations that severely limit VOC (volatile organic compound) content. Better quality high VOC coating are still available here but are only sold to professionals with safety certifications. When you hire professionals to do your tower work there is a good chance they'll use the better products. Guys and the towers they support are under tremendous and continuous stress. Each guy on my big tower has a pre-load of at least 1,000 lb (450 kg). That not only stresses the guy cable and every insulator, grip, thimble, shackle and turnbuckle the tower and anchors experience the stress due to the sum total of the attached guys. Then there's the live load due to wind and ice. 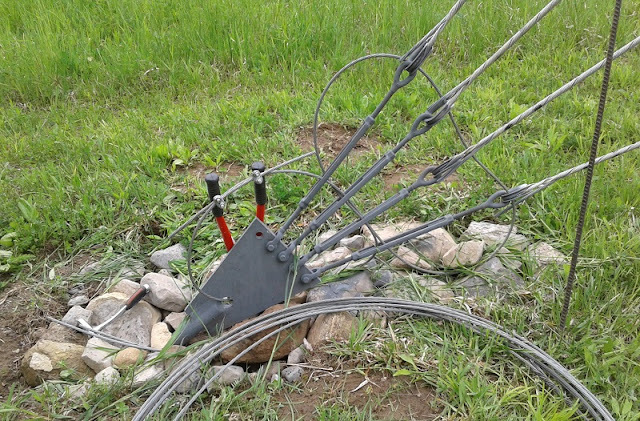 Deformation (metal yield) and stress risers are risks to tower safety. At each guy station on the tower there are three guys attached. The tension is trying to pull apart the tower while also putting a vertical force on the tower and the base. I have seen tower guy stations deformed by excessive force, whether due to wind, poor design, poor maintenance or fatigue. This is subject all its own which I won't cover here. Suffice to say that regular inspection is mandatory, never optional. As an example of what can be done with problem areas I inserted thick, wide washers under the nuts holding the guy yokes to the tower girt. The purpose is to distribute the load over a greater area of the girt which avoids stress risers due to the nuts alone since the design is such that the nuts are not flush to the girt for low and high guy angles. I omit the details since this problem is unique to the (now obsolete) LR20 tower. The point is that there may be potential problem areas in your choice of tower that should be dealt with before it goes up, especially if the tower has previously been in service. When a suspected problem is noticed deal with it immediately. If you're not sure of what you've found a useful technique is to take pictures of the area and email them to an expert. Cracks, fractures, metal bowing, fraying and similarly highly visible flaws are evidence of serious problems. Other flaws may be less visible. For example, some hams expose the top couple of feet of anchor rods every year or two to check for rust and other below ground damage. For an installation as major as a guyed tower it is good engineering practice to reduce or eliminate single points of failure (SPOF). That complete redundancy is impractical is no excuse to not do all we can to protect our towers from component failures. Guys are also popular targets for vandalism which, unfortunately, does happen to some hams as it does commercial towers. Prevent unscrewing of the turnbuckle. Despite the high tension constant vibration and cycling of wind and temperature can and does loosen turnbuckles. Turnbuckles can be weakened when they are adjusted under tension due to thread wear, torque on the body and infiltration of moisture and rust. 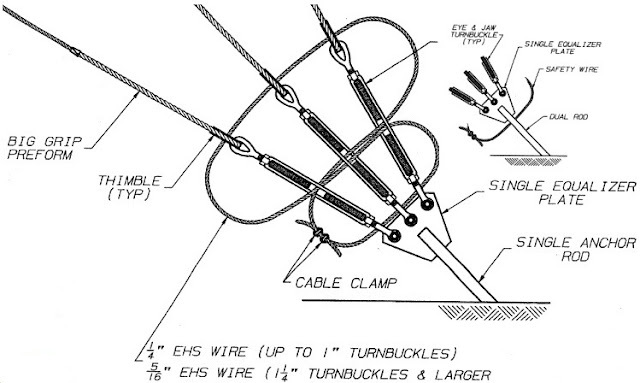 The EHS loop mechanically couples the guy and anchor should a turnbuckle fail. It can keep a tower standing when disaster strikes. There is more than one way to do this, depending on the anchor design. Many hams use back-to-back L-angle or U-channel steel (¼" thick or more) rather than rounds for the anchor rods since they can be built in a home shop without welding. However round rod is more robust when the anchor is not perfectly aligned, horizontally and vertically, with the tower, as often occurs. The safety loop is run through the gap between the steel members to additionally protect against equalizer plate failures which could develop stress fractures at the upper sides of the turnbuckle attachment holes. With round rods this may not be possible so the loop is run through the lower attachments, as shown. On my anchors the equalizer plates are welded to the rods. This leaves the lower hole in the equalizer plate unused. (Welding the plates is not uncommon for large commercial towers, which requires careful engineering and construction to correctly set the rod angle.) I therefore used this hole to provide protection for the equalizer plate. It only takes an hour to install the safeties on all 3 anchors. Only a few things are needed: ¼" EHS cable, bolt cutters and a wrench to tighten the clips. Notice the uniform gray colour due to the liberal coating with cold galvanizing paint, discussed earlier. The unequal threading of the four turnbuckles wouldn't happen in a commercial installation because the tower alignment and guy tension are set before the bottom grips are attached to the guys. This is not so easy for a ham to accomplish with simple and limited tools. The safeties must be removed to adjust the guys. To avoid the extra work I delayed installing them until I was satisfied that the tower was about as perfect as I could make it. The 10M rebar on the right was used as temporary though imperfect protection while the tower was aligned and guys adjusted.